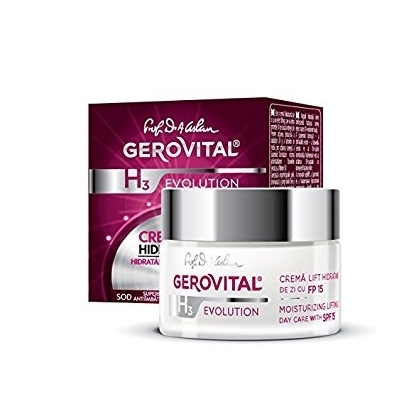 Cream rich in pure and liposomal hyaluronic acid 6%, SOD, GP4G and Trylagen, that have anti-wrinkle, line filling and smoothing effects, re-establish the barrier function of the skin and offer an intense hydration. 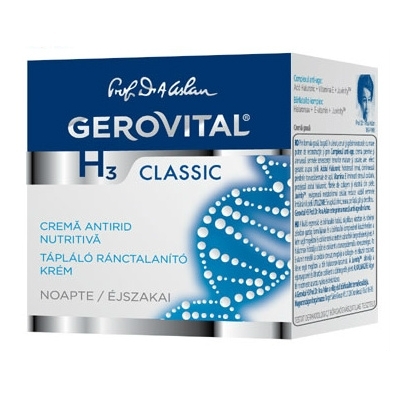 Serum rich in pure hyaluronic and liposomal acid 6%, liposomal vitamin C, SOD, GP4G and Trylagen with anti-aging effects such as line filling and smoothing, reestablishment of the barrier function of the skin, intense hydration. Liposomes with Hyaluronic Acid penetrate the skin and fill the wrinkles from the inside, therefore fine lines and wrinkles are much reduced. The anti-age effect is also enhanced by Superoxide Dismutase, which has a protective role both for the collagen and elastin fibers, and for the Hyaluronic Acid. Pure Hyaluronic Acid has intense moisturizing effects, acting dually by restoring the skin’s water reserves and reducing transepidermal water loss. Used regularly, the product visibly reduces deep wrinkles. Get the serum entirely at the bottom of the ampoule and then place it within the breaking point forward. For hand protection, wrap the ampoule in a tissue before breaking it. Pour the ampoule content into the palm of your hand and apply on the freshly cleaned skin by gently massaging it. 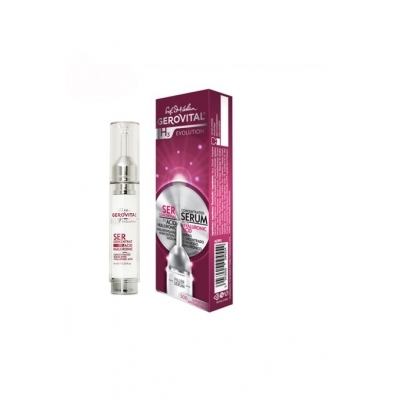 The entire content of the ampoule is used for a single application! 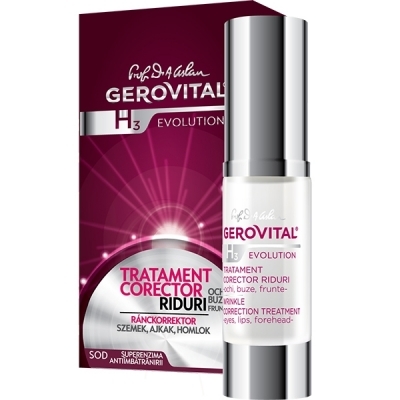 Once the serum is absorbed, apply the daily care cream from the Gerovital H3 Evolution line. Use the ampoules in the morning or in the evening in a 10-day treatment sessions. For long-lasting effects, apply this tratment every month. After 28 days of use, the product reduces the depth of profound wrinkles by 24%, while increasing the moisturizing level by 66,7% after only 1 hour after the first application (instrumental evaluation). IMPORTANT: avoid contact with the eyes. Gently cleans the face, eyes and lips, the small particles in the micellar water remove the make-up, the sebum, and other impurities. 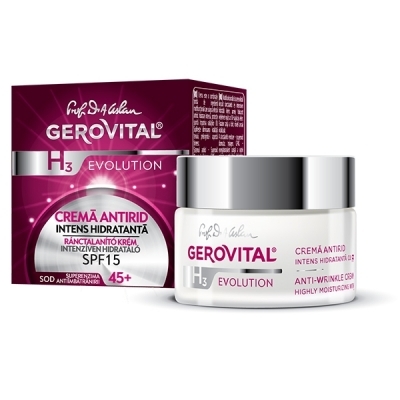 The Anti Wrinkle Highly Moisturizing Cream with UV Protection SPF15 corrects the skin imperfections, diminishes and erases the fine lines and wrinkles by means of the three ingredients: Sepilift, Lipomoist and Liposomes with Hyaluronic Acid. It provides powerful anti wrinkle effects, intense deep moisturizing and enhanced UV protection due to the smart combination of its versatiles ingredients. 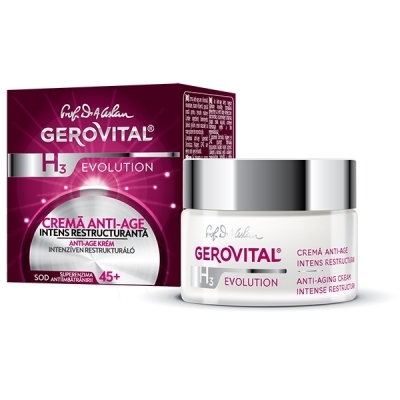 It prevents the destructive action of UV radiations and environmental factors by means of a synergic action between the Superoxidine Dismutase Anti-aging enzyme-Boswellia Serrata and UV filters. The use of the Anti Wrinkle Highly Moisturizing Cream with UV Protection SPF15 will leave your skin wrinkle free, deeply moisturized and fully protected. 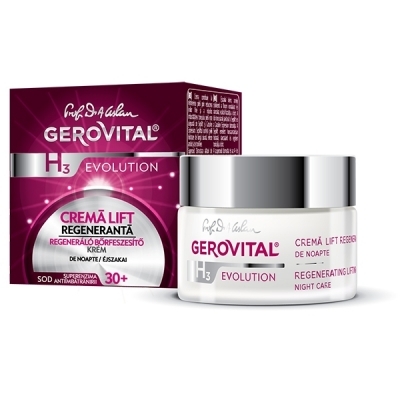 The Regenerating Lifting Night Cream is rejuvenating and remodelling the skin at night, during the natural regeneration period of sleep, when the organism self recovers after the stressors attacks during day time. 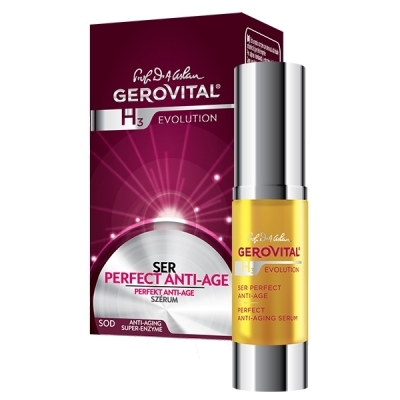 It contains Sepilift and Gatuline Expression extract providing intense lifting effects, anti wrinkle effects, long term moisturizing and tonifying effects to the skin. 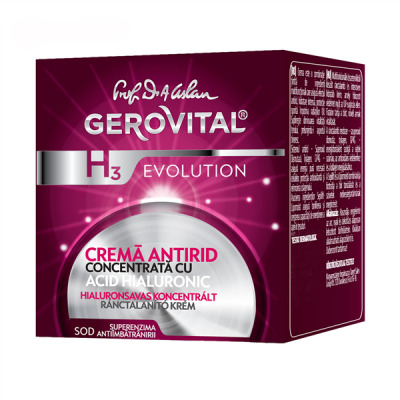 The key ingredients of this cream protect the collagen fibres of the skin preventing the appearance of wrinkles. GP4G, another ingredient is a source of pure energy, sustaining the regeneration and restructuring processes of the skins. The Liposomes with Sodium Hyaluronate are being absorbed into the skin and fill in the wrinkles from within, having unique benefits for wrinkle prevention and wrinkle treatment. 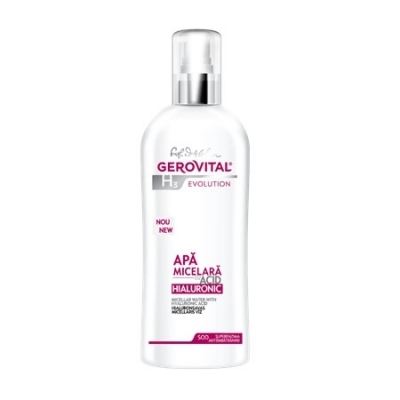 Recommended for the care of dry complexions or one which presents a tendency for dryness, young or mature. The wrinkles are visibly diminished one day after the application and within 10 days the skin's microrelief is substantially improved. 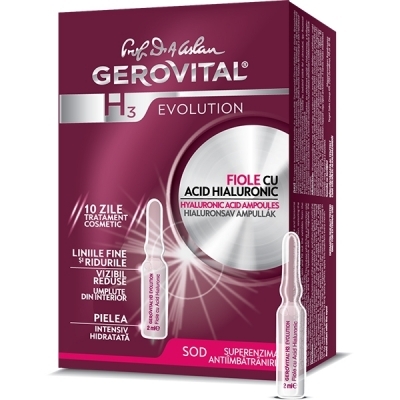 The liposome, together with the Hyaluronic Acid are absorbed by the skin and the wrinkles are filled from the inside and smoothened.Deep wrinkles are diminished through the synergic action of the ingredients Trylagen, Superoxid Dismutaza, Vitamin A and E which prevent the structural alterations of the collagen fibers and stimulates the new collagen synthesis. The expression wrinkles are diminished through the myorelaxant action of the Ginger and Gutuline extracts.